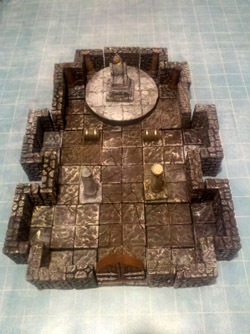 Like most people with a passion for wargaming or dungeon crawl RPGs, and with a finite budget to a lot towards my hobbies, I have long coveted Dwarven Forge’s line of miniature terrain.Their stiff looks amazing, but unfortunately, it is NOT for the moderately budgeted, so I have always steered clear of gazing too lustfully at their offerings. That’s why I was so excited to see the massive setup by Legendary Realms at NYCC. Although ostensibly designed for use with The Secret Fire RPG, this terrain is readily adaptable and usable in any wargaming or tabletop RPG system. And, from what I could see, the terrain setups were significantly more affordable than the Dwarven Forge equivalent. 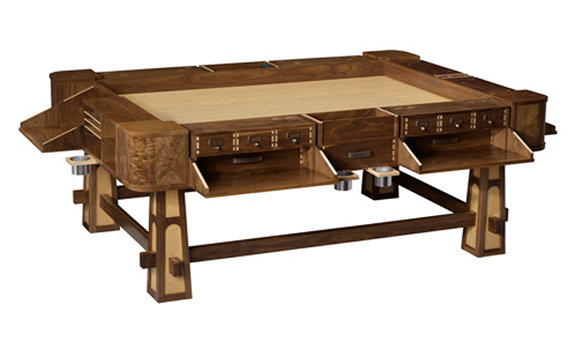 (Disclaimer: I haven’t subjected either to the rigors of actual table play, so the price might even out in the durability of the product.) Check out their stuff, and happy gaming! May all your hits be crits! Speaking of tabletop gaming, and things I can’t afford, Geek Chic once again had an amazing display at NYCC of beautiful nerd furniture that I cannot afford. Someday, when I have amassed my personal fortune, I will employ the fine people at Geek Chic to furnish the massive Nerdcave found within my palatial estate. All of my comics shall be assembled in The League storage units, and all of my gaming shall take place on the majestic surface of The Sultan gaming table. I’m seriously thinking of starting a Kickstarter to make this dream happen. If you contribute, you can come over, and I’ll run the RPG of your choosing. I think this is a win-win, personally.